1. How long have you known each other? How did your friendship begin? Sandy: Ilene and I have known each other for almost a year now. I'm not sure how we exactly first met but I believe it was through twitter (through a mutual blog friend, Yellow Songbird) or me discovering her beautiful etsy shop. Looking back at my comments, it looks like the first one she left on my blog was June 2010. Our friendship pretty much began through twitter and commenting on each other's blogs. At that time, Ilene was more focused on her shop and I was more focused on my blog... but after some time I wanted to open up a shop and she wanted to focus on her blog. So then, we pretty much decided to be each other's mentors. 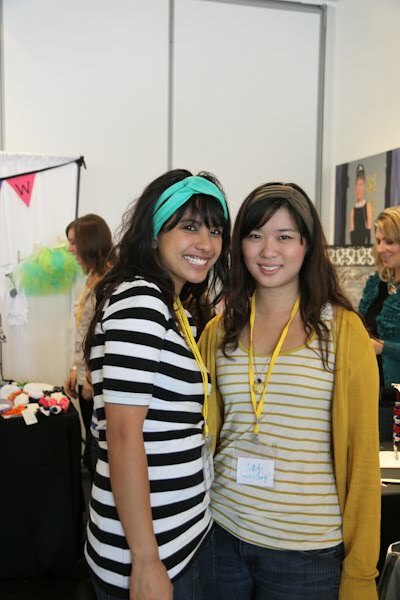 Ilene was my etsy mentor and I was her blog mentor and that's when our friendship really took off. Ilene: I remember the first time I had even heard of Sandy was when Danni of Oh Hello, Friend featured her bunting garland DIY. I clicked on her blog and was immediately amazed by her talent and beautiful blog. I don't think I ever imagined that we would end up becoming blog bffs! (Hehe, that's what we called each other!). I started following her blog and twitter from afar from that point on. But the friendship itself kicked off from out meet-up in Chicago in the summer of 2010. She tweeted me about doing a blogger meet-up while she was in the city, and I remember freaking out and telling one of my friends who read blogs too that the Sandy of Sandyalmode wanted to meet up with me?! When we met up though, I realized that I had nothing to be nervous about - she was super down to earth and friendly. The two hours we spent at the Grand Luxe flew by and I remember wishing we had even more time to talk 'cause we connected super well! 2. How do you two normally communicate? Ilene: Ha! In any form possible, really. We tweet and text a ton. I think it's really odd if a day goes by and I don't hear from her. We'll email if we have a project to work on together. We've talked on the phone before but with both of our busy lives, we mainly do the modern thing and text/tweet. Sandy: Ilene and I communicate mostly by tweeting and texting each other. She pretty much always fills up my DMs on twitter and I sure don't mind! If we have something that requires major discussion, then we'll email. We've only talked on the phone a handful of times. I don't think there is a day that goes by that we don't have some type of contact with each other even if it's just to ask how each others' days went. 3. Have you met in person? What was it like to meet that person face to face for the first time? If not, do you plan to? Ilene: Like I mentioned in the first question, we met back in Chicago for the first time last summer. We also got the chance to see each other again at a bloggers/handmade business conference and it was like catching up with an old friend. We picked up right where we left off! As for the first time that we met, I didn't know what to expect. I remember telling Sandy that it felt like a blind date! You know all these things about a person but you don't really know if you'll click until you actually meet them in real life. But like I said, she and I totally clicked and am so glad we did! Sandy: We first met in the summer of 2010 in the fine city of Chicago. Ilene was working there and I was stopping by on my way to a business trip. I had tweeted a few days ahead of time seeing if there were any bloggers in Chicago that wanted to meet up, and Ilene took me up on the offer. We met at a restaurant for lunch and ate delicious foods, took tons of pictures and had so much to talk about. We only had a few hours with each other but we bonded instantly then. We also recently just met up and were roommates for the Creative Estates handmade/blogging conference in Arizona. We got to spend a whole weekend together talking about our lives, our boys, fashion and more. We even did outfit pictures for each other as that is something we enjoy blogging about! 4. How is your internet friendship different from friendships you have offline? Sandy: Most of my friendships I have offline are my friends from high school, college and my job. However, since I started my blog in January 2010, blogging has become my full-time hobby and I love it. Before I started my blog, I never knew about the huge, vast, amazing, encouraging blogging community that I would soon be a part of. People who don't blog don't really understand all the things that blogging entails, writing and scheduling posts, followers, comments, sponsors, etc. I love that I can rely on Ilene as a great support system if I want to bounce ideas off of her or even have her double check that I didn't miss anything in a giveaway post. Even though we are miles apart, I feel so close to her since we can always have immediate contact with each other through text/tweets and we have so much in common. And a lot of times we'll tweet or text each other the same thing at the same time, talk about BFFs!! Ilene: I don't think that my internet friendships are too different 'cause I really try to portray me as me. What you see is what you get. And this totally confirmed that when I met up with Sandy and other bloggers in AZ - they said that I was just the way they "imagined" me to be. Oh, except my voice was lower than they expected! It's so true! And when it comes to me and Sandy, she really has become more than a blogging bff. We talk about more than blogging - so maybe I should just take "blogging" out of that phrase. Since we tweet/text throughout the day, we are always in touch so I feel like I can share just about everything with her! I've vented and I've shared joys with her - just like I would with any close friend offline! 5. What drew you to the other person initially? What do you love most about them? Sandy: What drew me to Ilene was the beautiful poppies she makes, her fun and encouraging tweets, and her super cute blog posts with great pictures. Ilene is one of the biggest sweethearts I know and you can tell instantly from reading her blog. She always left (and still leaves) comments on my blog with tons of exclamation points (as do I on other blogs)!!! :) What I love about her most right now is her awesome fashion sense and how we can virtually shop online together, her caring and compassion as she checks in with me periodically, and how she encourages me to no end on my shop and blog. 6. Do you have any other thoughts about the role the internet plays in building new relationships? Ilene: Well, I think you can't have the expectations that you're gonna be best friends with everyone in blog world. Like in the real world, people are different in the blog world - different perspectives, interests, personalities, etc. But then it's a HUGE world there is a whole gaggle of people just like you - and once you find that person or group of people you connect to, you should jump on that band wagon! And though this is said so often, it's so true (that's why I think it's said so often), just be yourself! Don't try to change who you are online to fit in a group of friendship. It's easier to do that online - I think we've all been tempted to just show our "good" sides but just BE YOU. you go a lot further that way - plus if you ever meet blog friends in real life, they won't be surprised! Sandy: Despite the fear that some might have about meeting people online, the thing with meeting people over blogging is that a lot of times they will share tidbits about their life, pictures, and more so that you are able to get to know a person through their words and pictures. I love sharing these things about myself but I try and be cautious about not over sharing too many personal details as well. When I met Ilene for the first time in person, it was like I already knew so much about her and what she looked like, that there wasn't an awkward or shy period in the beginning. Through blogging, I have met many people from all over the world and since in my line of business I'm always traveling all over the place, it's nice to meet up with blog friends in new cities!! Aren't these two just the sweetest?! My favorite thing about the two of them that gleaned from their answers and from following them on Twitter is that they are amazingly supportive of each others' creative endeavors. I've found that my blog-friends are more understanding and supportive of me Etsy shop than people I know in real life. I think it's because (in my case) they understand the amount of work that goes into running a business online. Do you see a difference in the way people support you depending on if they're online or offline friends? Want to see more Connections posts? I need your help! I'm looking for bloggers willing to share their stories! Email me at susannahbean@gmail.com with the subject "Connections"! What an AWESOME feature! I read both of their blogs and I think both these ladies are so sweet! So fun to read about how their friendship began and grew!